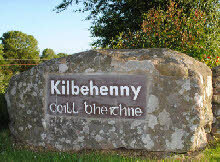 Kilbehenny Community Centre is known far and wide for the service it provides to Funeral members who have lost a loved one. The centre caters for the get together after the funeral Mass and burial where food is provided. A new top class HSE approved Kitchen has been installed and this allows the ease and flow of catering for any event. The local members of the community come together on a voluntary basis to help prepare the hall and serve food. The volunteers are only too pleased, as it gives them the opportunity to give something back to the community. There are times when we need that extra pair of hands to help out. If you feel you may have some free time on your hands, we would be very grateful if you could contact us and we will add you to the list of volunteers. Congratulations to Kilbehenny National School on their Small School of the Year Award at the Cumann Na mBunscoil awards in Sligo. Well done everybody – great achievement. We have a packed schedule from Social dancing to Irish Dancing, Yoga Class for everybody that would like a good stretch – Zumba, Line Dancing, Cards, Brownies, ICA, Knitting workshops, Cards, Special Friends, the list goes on… the place is bubbling with energy and fun. If you would like to book any of these classes in 2019 or find out more about our rooms available to rent , let us know. Room hire is very reasonable and the atmosphere and layout is first class with beautifully decorated comfortable and affordable rooms to hire. If you would like to learn more about Kilbehenny Community Centre or would like to add to our notes etc.